The oft-overlooked Teasmade has just got a new alarm-clock friend in a new bedroom gadget that wakes you up with the fragrant smell of cooked bacon – the Wake n' Bacon. Matty Sallin, Daniel Bartolini, and Hsiao-huh Hsu teamed up to design the Wake n' Bacon alarm clock. 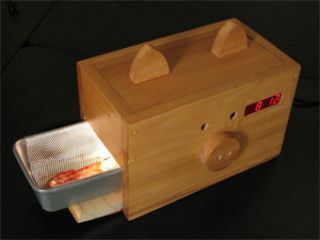 Pop a small slither of frozen bacon into the little piggy's tray before you go to bed and the Wake n' Bacon cooks the pig-meat with two halogen bulbs ten minutes before it gently buzzes you awake. "WHY?" reads the blurb on the designer's website. "No one likes to wake up, especially by an alarm. This clock gently wakes you up with the mouthwatering aroma of bacon, just like waking up on a Sunday morning to the smell of Mom cooking breakfast. Unless you're Jewish."